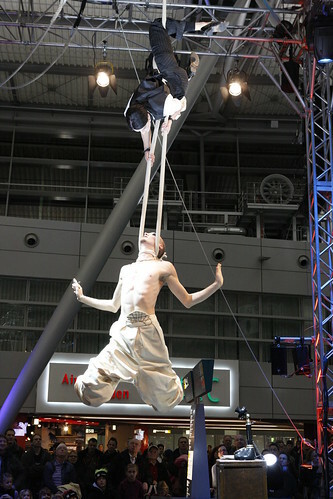 In December 2010, I was selected to take part in the 2nd International Circus Festival at the Düsseldorf Airport. The talented performers came from all over the world to share a very unusual and exciting day at the German airport. The whole departure hall in the terminal was used as the performing area, which provided an extraordinary and impressive backdrop as well as free entertainment for the transient audience. 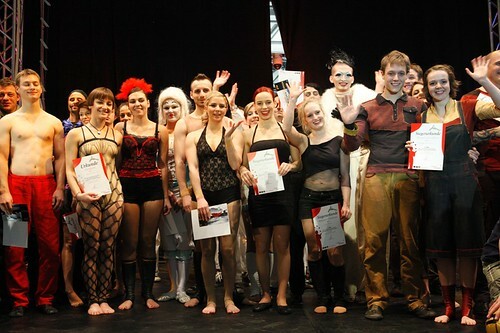 We performed in front of a top-class jury of circus experts, including the Director of GOP Varieté Essen, who awarded prize money, engagements by GOP Varieté Essen and by Et Cetera Varieté Bochum as well as prizes in kind from Jack Wolfskin. Although we were measuring ourselves in a competition, the atmosphere was very friendly and all the artists were very supportive of each other. Photos were taken by Andreas Wiese and you can find more on my Flickr.